The first line of defense against a Godzilla incursion is obviously going to be the military, though who’s military obviously depends on where he first makes landfall. They may not be the ones who finally destroy him or drive him back into the ocean—it always seems like those smarty-pants scientists play a big role there—but they’re going to do their damnedest to take him down while they can. This latest clip from Gareth Edwards’ Godzilla reboot, and a video from the Air Force, indicate just how two branches of America’s military might go about combatting the giant, scale-covered monster. Watching Godzilla toss around these ships like toys, not to mention seeing him superimposed against the Golden Gate Bridge, give you an idea just how massive you have to be in order to be crowned King of the Monsters. It’s pretty damn big. He’s not even the one causing most of the destruction, it’s the wayward missiles launched by the naval vessels that are really wrecking up the joint. Don’t get me wrong, I’m sure he’ll have ample opportunity to make a mess, but don’t go blaming every last bit of it on the big green lizard just because he looks like he’s up to no good. Too often, film prequels are created not to delve deeper into an original story, but to try and sap dollar bills out of an unassuming public’s pockets, with a story that is somehow bigger and better than the events that supposedly come after it. For Gareth Edwards’ upcoming tentpole Godzilla — a film that GFR writers are literally frothing from all orifices for — Legendary and Warner Bros. decided to head to the graphic novel medium to detail the events that set the film in motion, much as they did for last year’s Pacific Rim. 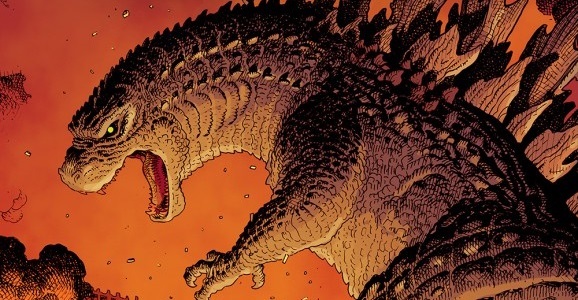 And though it’s almost impossible to duplicate Godzilla’s widespread mayhem on a two-dimensional comic page, the talented team behind Godzilla: Awakening have come about as close as it gets. Sadly, the story isn’t complex enough to transcend the label of “prequel tie-in” or to become an essential Godzilla story in its own right. Still, it is action packed and fun enough to stand as the best possible example of the tie-in variety. I find it impossible to truly dislike any Godzilla material, barring the 1998 disaster, so don’t let my pretentious objectivity throw you off. This is Godzilla; ipso facto giganto, it’s a damned good time. Godzilla will finally hit theaters in less than a week, after what feels like the longest waiting period ever assigned to anything. Thankfully, the anticipatory stress has been purely mental instead of physical, like the agonizing wait that precedes being able to urinate after drinking the equivalent of a medium-sized wavepool. Say, that sounds like a flawless segue leading us to a story about how much urine Godzilla would produce! It’s undeniable that part of science fiction’s appeal is applying real-world science and statistics to imaginary situations, and sometimes closer looks can lead to breakthroughs that bring our world just a little bit closer to those of the genre’s most prescient authors. That said, I’m almost certain our daily lives won’t be changed by knowing how much Godzilla pees, but at least it won’t be curiosity killing us cats. Yesterday we showed you the first official clip from Gareth Edwards’ Godzilla, and it was a good one, like clapping and giggling good. How can you not get excited as two giant monsters are about to collide for your entertainment? And because nothing about this movie is small, from the titular protagonist right on down to the marketing push, Warner Bros. and Legendary Pictures have unleashed four more clips, as well as more than eleven-minutes worth of behind the scenes footage. This first clip is the most interesting and the most exciting of the bunch. We know the winged creature that we’ve seen on occasion is called MUTO, which stands for Massive Unidentified Terrestrial Organism. Here’s the catch, this sumbitch is no longer Earthbound; this bad boy can fly, which is going to be a problem. Another problem is that this beast also releases enough EMP that it disrupts radar and any other attempts to track it, rendering the military essentially blind. They know it’s flying towards the West Coast of the US, but that’s about it. If you’ve been paying attention, you probably assume it is going to touch down in San Francisco, but we could be wrong, there could be other stops on the tour, like Hawaii. 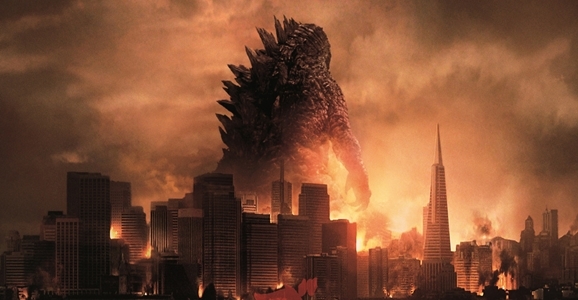 Godzilla is now less than two weeks away, and we’re all getting excited to watch the iconic lizard step on buildings and generally cause a ruckus. Because we know that the King of the Monsters isn’t the only giant beastie in the film—we’ve now laid eyes on Muto, the winged opponent—we assumed that that the two would tangle at some point. After an absurd number of TV spots, Warner Bros. and Legendary Pictures have released the first official clip from the film, and it sets the stage for just this kind of massive monster battle. If this footage doesn’t get you pumped for Godzilla, you might want to check your pulse to make sure you’re still alive. We’ve heard that director Gareth Edwards doesn’t show all of his cards right away, that he keeps the monsters rather hidden and obscured for much of the movie. If that is true, you have to imagine that this clip comes from somewhere later in the movie rather than early on in the action. I can’t figure out how to type the weird little noise I made watching this video. It wasn’t quite a squeal, it wasn’t quite a howl of joy, but whatever the hell it was, it was definitely a very happy sound. Could Mothra Appear In Godzilla 2? Godzilla doesn’t even open for another two weeks—slightly less than that now, actually—but, like every big Hollywood blockbuster that people expect to rake in big bucks at the box office, that’s not going to stop anyone from talking about the future of the franchise. We know that the big guy isn’t the only monster in the new movie—there’s an entirely new addition to the canon named Muto who we’ve seen primarily in toy form. We’ve now heard that at least one fan favorite opponent isn’t in the film, but apparently could appear in the Godzilla 2, should such a thing come to pass. Warner Bros. and Legendary Pictures have just started screening Godzilla for members of the press, beginning with New York and Los Angeles. While critics are still embargoed from reviewing the movie, that isn’t going to stop anyone from discussing it entirely. Director Gareth Edwards did a question and answer session after the LA screening. Badass Digest was present and says there’s an interesting Easter egg in the film that could provide a hint about future installments.